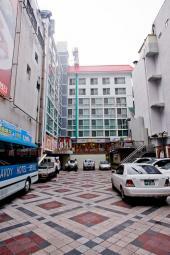 Savoy Hotel, opened in September 1957, is a easy to reach five-star accommodation in Myeongdong. Thanks to renovations, the simple and modern interior of the guestrooms better provide rest and comfort. There are 103 guestrooms total, with 9 room selections ranging from Single to Suite rooms types. It also has the most Ondol rooms in Myeongdong for family guests. The guestrooms boast diverse selections with both traditional and sophisticated qualities. Myeongdong also offer great transportation along with diverse shopping, dining and tourist experiences in the area. Myeongdong station (subway line 4) is 3 minutes away and Euljiro-Ipgu station (subway line 2) is 6 minutes away. Guests can take subway line 3 to easily reach Apgujeong and Shinsadong within 10 minutes. Also nearby are Lotte Department Store, Lotte Duty Free Shop, N Seoul Tower Migliore Shopping Mall, Dongdaemun Market, Insadong and Deoksu Palace. B1 Cafe & Restaurant "Goody Goody"